How does a professional race car driver navigate normal traffic? 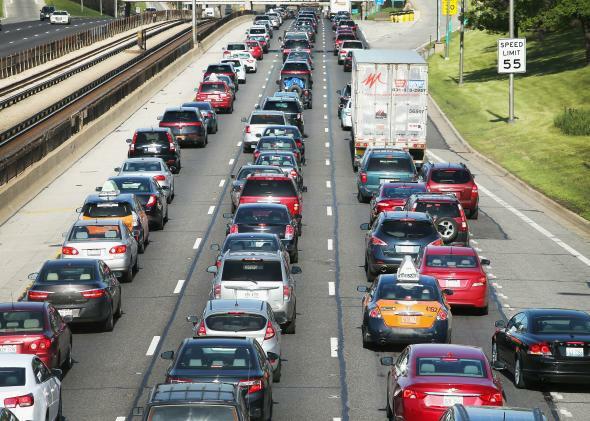 Traffic jams up on the Kennedy Expressway leaving Chicago on May 23, 2014. I’m a professional driving coach and race car driver, currently licensed, and competing in International Motor Sports Association Continental Tire SportsCar Championship and in Pirelli World Challenge Touring Car. For me, driving in traffic on the street isn’t much different than in traffic on the race track. Wait, don’t take that the wrong way. When I’m in traffic, on the street or on the track, I’m always looking for the most efficient way through. Often, it’s where I am, behind the car I’m already behind, and going with the flow. The only difference comes when it’s time to go around that car. On the street, I always use my turn signal, move with purpose, but not like an asshat, and with confidence. Being polite on the street is important to maintaining or reducing the level of road rage. On the track, it’s a different story. We don’t have turn signals, or if we do, I honestly don’t know where the switch is. The pit speed limiter will usually activate the hazard flashers among other lights, but that’s the extent of signaling. The movement is definitely purposeful, but there’s not a lot of care taken to stay away from light contact. I’m not going to punt the guy off track—that’s being an asshat. I will, however, be happy to leave a doughnut mark on the side of his car. I don’t think I’ve ever finished a race without a little bit of paint being traded. Again, not enough to upset the balance of either my car or my opponent’s car, but enough to let him know I’m there. If you’re polite, you’re not making the pass. There’s no request to be allowed to pass. You have to make the move, do it cleanly, and then hope it doesn’t happen back to you in the next corner. Let’s call it “kinetic encouragement” when we make mild contact. Spinning someone, or knocking him off track, is not cool. Regardless, there’s usually a thumbs-up or even a slap on the back after the race with something like, “Damn, that was a good pass” tossed in there somewhere. Most of my colleagues act the same way as I do on track. Some are slightly more timid, and others are extremely forceful. To sum it up, it’s not really that much different in traffic on the street or the track, as you’re really paying attention to where the flow is working best and how to get through more efficiently. I guess the speed and level of contact are the real differentiators. I’m also a big believer in cruise control. I use it extensively. Obviously, I brake when the traffic in front of me isn’t passable, but I set the cruise to the speed limit, even on 30 mph roads. There are places where it’s almost comical to me that people slow down. On interstates, there might be a long, slow curve, and people brake for it. There’s a flyover where I live, going from one 65 mph road to another. I typically leave the cruise set to exactly 65, verified by a precision 20 Hz GPS, and just drive normally on the flyover to the other road. People consistently slow to below 40 mph to take that flyover. I’ve done it in an SUV, a minivan, and of course a sports car. There’s no reason the average driver couldn’t do it in his car if he had the proper training. With that said, go get the proper training. Take your car to your local high-performance driver education event at your nearest raceway and discover what your car is capable of and what you’re capable of. Eyes up, look through the corner, look where you want to go, and go there. Auto Racing: Isn’t car racing all about the fastest car? Cars and Automobiles: Why are the rear wheels of buses not provided at the extreme rear, but at about 1/4 th distance? Formula 1: How can one get to work at an engineering position in a Formula 1 Team?